It is useful to consider these latter phenomena from a conventional stress - strain curve perspective. The stress strain curve for a typical ductile steel, exhibits a downwards concave shape, where the start of non-linearity region corresponds to initial plastic behaviour, ductility and more extensive plastic behaviour. The slope of this part of the conventional stress strain curve is indicative of the extent to which the material work hardens, or increases its local strength, with increasing extension, largely through dislocation build up and increased resistance to further deformation. This increase in hardness by dislocation proliferation is quite real and measurable and can only be effectively removed by annealing the material, which re-distributes and effectively removes the pile up of dislocations. This pinning or pile up of dislocations also increases the measured yield strength, as the curve more closely approaches the Ultimate Tensile Strength (UTS) limit. As such, work hardening effectively increases the point at which plastic behaviour initiates, but does not increase the overall strength (in terms of UTS) of the material. Following from the preceding discussion it should be noted that there is a clear and fundamental difference between ‘work hardening’ and ‘hardness’. Work hardening refers to the increase in yield strength caused by strain induced dislocation pile-up in ductile materials. Whereas hardness is a measure of a material’s overall intrinsic strength, or its UTS. This metallic strength depends on several factors including intrinsic bond strength, atomic bonding between metal nuclei and ions as well as other factors, including alloy content, composition and strengthening precipitates. Hardness measurements reflect these intrinsic strengthening contributions and may be regarded as a convenient estimate of such strength. But a most revealing perspective is that the various hardness measuring techniques are dependent on various other parameters, including Poisson’s ratio, yield strength range, the work hardening exponent, as well as geometrical factors. Consequently, there is NOT a unique relationship between hardness and a materials’ yield strength (because of the variable extent of work hardening) and indeed only an approximate relationship between hardness and UTS. This relation, in most texts, refers to the Tensile Strength (in MPa) being approximately equal to the Vickers hardness divided by three. This is however an approximation and has a range of error of several points (approximately 2%). The use, by engineers of approximations, to gauge the strength of materials through hardness measurements is widespread and indeed useful but it should clearly be recognised that the correlation (of tensile strength being regarded as HV/3) is an approximation and this should always be borne in mind. 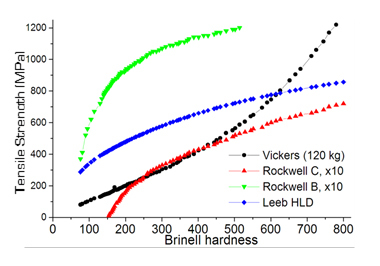 A final point in regard to hardness, which we have quantified and correlated with published data, is that the various hardness techniques (of Vickers, Brinell, Rockwell (A to F) as well as Knoop and Shore) all measure somewhat different parameters and behaviour, and consequently their relationship to UTS is not consistent, even in their trended behaviour or graph shapes, as shown in the attached figure of hardness test correlation to UTS.